Whispers carry the stories through the generations. So unreal that people no longer believe. "Legend." They do not realize that legends can be more real than real. We’ve all heard the stories. Alligators live in the sewers. Kidney thieves prowl the cities. Chant “Bloody Mary,” and she appears. These are urban legends. In the World of Darkness, they are real; in fact, they are more than real. The truth behind each legend is more terrifying, strange, sinister, or diabolical than we imagine. • Inspiration for a game intended for mortal characters, but a game just as frightening and bizarre for monstrous characters. 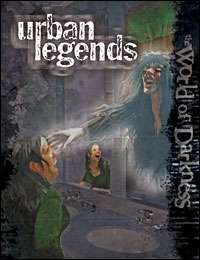 128 pages, for use with the World of Darkness Rulebook.